Real estate photographer Kate Devlin takes aim at the kitchen in a home in Laverock. Photographer Kate Devlin takes the time to consider all four corners of a room. Bare or cluttered, tight or spacious, the next corner always offers a different view. Is the best photograph of a living room the one that reveals a glimpse of a stairway and not the open kitchen that lies directly ahead? Or should she shoot both angles? An online real estate listing typically has 25 photographs these days, another reason to consider multiple perspectives. Devlin recently moved about the living room in a Fitler Square rowhouse calmly and quietly. She settled her tripod in a spot where the staircase sat out of range, then found a shot that captured the width of the living room, but also the stairs in a mirror's reflection. Devlin, who lives in Fairmount, estimates that she shoots about 525 homes a year. Real estate photography isn't a new field, but it carries new clout in the internet age as searching for homes online has become a near-universal experience. According to a 2017 National Association of Realtors survey, 95 percent of home buyers used the internet to look for property; 68 percent are doing so on their phones. The new imperative? Entice potential buyers to keep swiping. Sixty percent of Realtors, according to another 2017 NAR survey, recommend leaving photos to the pros, in part, because the pictures won't be viewed solely by potential buyers. Photographer Drew Callaghan, based in Queen Village, noted that many photos survive in online databases after sales close and serve appraisers, insurance firms, and developers in their research. Callaghan, who worked as a real estate agent before shifting to photography, remembers simpler times. To prep a house for market, he recalls hiring a cleaner and setting up an open house. If a home was photographed, he said, the focus was primarily on the exterior. Realtor Mike McCann remembers this era, too, in the 1990s, with the old, printed black-and-white listings that included only thumbnails. Back then, he said, the going rate for a color brochure was $1,800. Today, while some photographers may charge hundreds, others can be commissioned for under two Benjamins. Now McCann has every livable home on his roster shot professionally. When he sits down with clients, he primes them on Devlin's work as part of a package of services they can expect. Real estate photographer Kate Devlin checks the LED screen of her Canon digital SLR to make sure her exposure of the staircase in a Glenside home is correct. Professional photography, along with home staging, is a trend reflective of larger industry shifts to try to make homes competitive for buyers with limitless listings at their fingertips, said Jessica Lautz, managing director of survey research and communication at the NAR. When prospective homeowners show a listing they like to a loved one, Lautz said, it isn't too different from friends opening Tinder to discuss their matches. Photo-led listings can be quickly devoured, but they're also easy to share. "It makes it easier to visualize yourself in the property, but also makes [buyers] more willing to visit the house, as well," Lautz said. 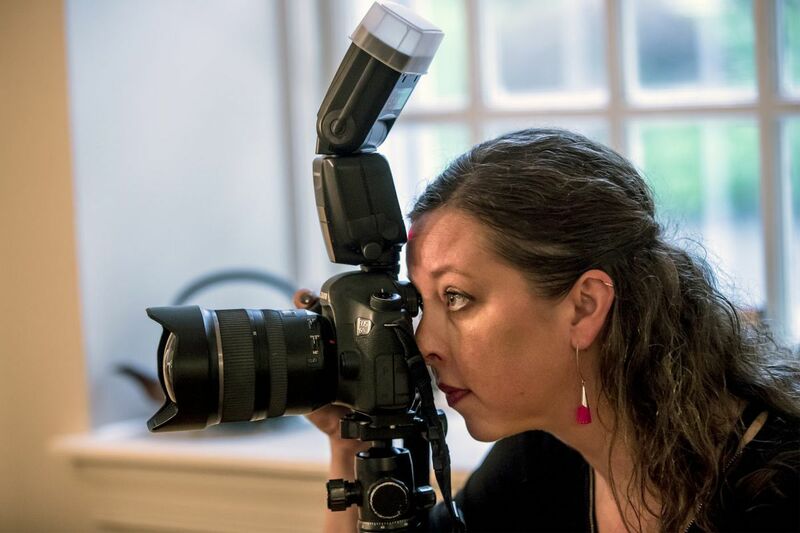 Devlin, 39, earned a bachelor's degree in painting at Moore College of Art and Design in Philadelphia but had been working in restaurants before she found real estate photography about eight years ago. "A friend of mine needed somebody and said, 'Do you have a wide-angle lens?'" Devlin said, thinking back. "I've been doing it ever since." Wide-angle lenses can help make a room look spacious, but shooters must be careful not to take things too far. Realtors don't want to face angry home buyers who feel tricked when they see the space in person. With a wide-angle lens, a piece of furniture toward the back of a shot can appear distant, while a telephone near the front can look like a Buick. Even without staging, Devlin moves things around. At a townhouse in Fairmount, Devlin removed items that could appear clutter-ish, such as kids' toys and outerwear. She'll position a colorful bowl of produce to catch the camera's eye but also nix items that could be too bright, such as a bottle of blue Listerine or orange liquid soap. Trash cans, shoes, weight scales — she'll hide those, too. The homeowners' job is to hide themselves. Weather has a strong effect on Devlin's output. Sometimes, Realtors want to reschedule if the light isn't right. Others tell her to go for it, but even in these cases, Devlin said, she'll often return to shoot the exterior. The sweet spot for both inside and out is a day with blue skies and light cloud cover, something she articulated while waiting for a cloud to mosey toward the sun on a recent bright afternoon. "You'd be surprised how much time I stand watching clouds." Devlin checks out the LED screen on her camera to review the composition of the foyer photograph for a home for sale in Laverock. Devlin has a quietly pleasant temperament, an attribute on a job that, in theory, is supposed to be in and out, but often calls for interactions with residents experiencing major life changes. Although Devlin shoots many empty spaces, she also enters occupied homes where homeowners are going through a divorce or a tenant has just learned the landlord is selling. And she sees "a big assortment of care," Devlin said. "I've seen bongs being left out on the table, and it's, like, really?" Homeowners Sumi Maeshima and Atsushi Moriyasu in Fitler Square seemed at peace when they explained that they were returning to their home country, Japan. So did Kathie Daley in Laverock when she described how she hopes to downsize to a modest farmhouse in Bucks County. Currently, Daley and her spouse, Richard Sand, live in an 8,645-square-foot historic mansion. Realtor Rob Lamb, who works with Devlin often, asked her to capture the estate. "Anybody can have the tools," Lamb said. "But she has this slight artistic, creative touch that folds itself into the photos and becomes a part of the story." When Devlin submits photos after a shoot, Lamb and his team develop the sequence for the listing with the seller's approval. The goal is that each photo will draw the viewer to the next, Lamb said. "You want to get them deeper and deeper into a stream of photos," he said. "If you don't catch them there, on to the next house." A close-up of antique mural wallpaper that Devlin took while shooting an estate in Laverock. Devlin's bread and butter continues to be wide room-length shots, but she has begun taking more details for social media. That intense closeup of carvings, tiles, or the azalea bush through the window might not work in an online listing, but it could kill on Instagram. To shoot the dining room of the historic mansion, Devlin carried in a vase of flowers to provide a centerpiece and turned off the lights. She tries to avoid the glow that light fixtures can create, relying on a combination of flash and long exposure times. She set her camera for a 1.6-second exposure time, so the details of the panoramic mural wallpaper — from a series also brought to the White House — would come into view. Devlin is careful to note that the work she does for listings isn't the work she'd do for Architectural Digest. Even if there is careful staging, sometimes she has to pull back and make sure that each closet is included. "Sometimes I take photos that aren't terribly pretty," she said, "but I need to show how the room works."